Floral Bubbles is the unofficial name of this pattern. 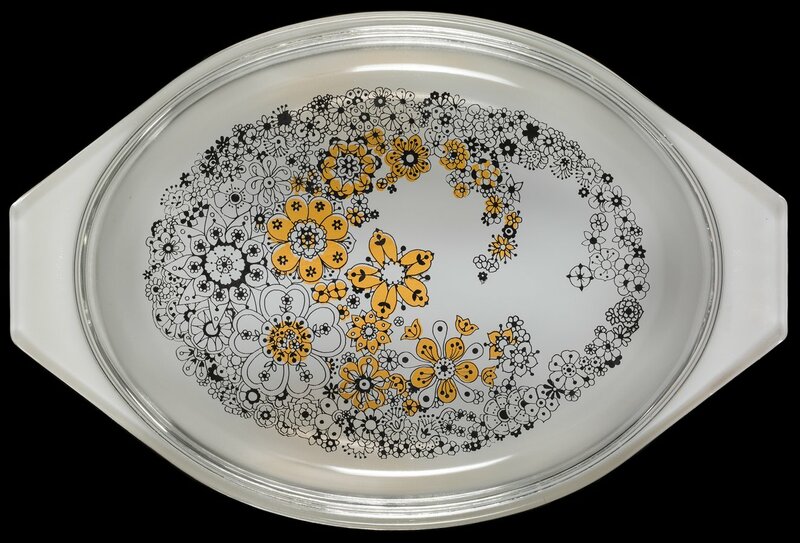 The Floral Bubbles clear lid has a unique design with flowers printed on both the top and underside of the lid to create a 3-D effect. Released in late-1970, this 2 ½ quart Oval Casserole (945) came with a double candlewarmer. One of the more unique lid designs, the unofficially named Floral Bubbles has black outlined flowers printed on the top of the clear lid and solid brown flowers printed on the underside of the lid. This double-sided printing effect gives a more three-dimensional look to the lid.